- Publisher Joseph's dream had come true at last God had spoken to him and prepared him for a very special job... Find out what it was and learn how God looks after his people in every situation. You can read about this story in the Bible in Genesis, chapters 3746. - Publisher Well known manual of doctrine for all those requiring an introduction to the Christian faith.This edition contains the addition of scripture proofs in full notes by Roderick Lawson. The Westminster Shorter Catechism has been an effective tool for teaching the Christian faith to young and old for over 300 years and is still used in Presbyterian and other reformed churches to this day.This is one of the most popular editions as it contains proof texts to aid a parent or teacher in their instruction. 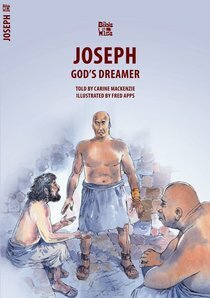 About "Joseph, God's Dreamer (Bible Wise Series)"
Joseph's dream had come true at last God had spoken to him and prepared him for a very special job... Find out what it was and learn how God looks after his people in every situation. You can read about this story in the Bible in Genesis, chapters 3746. Well known manual of doctrine for all those requiring an introduction to the Christian faith.This edition contains the addition of scripture proofs in full notes by Roderick Lawson. The Westminster Shorter Catechism has been an effective tool for teaching the Christian faith to young and old for over 300 years and is still used in Presbyterian and other reformed churches to this day.This is one of the most popular editions as it contains proof texts to aid a parent or teacher in their instruction. BIBLEWISE BIBLE STORIESCarine MackenzieThis delightful Bible story series features striking illustrations and simple,engaging text. Children aged 5-6 will enjoy reading these stories forthemselves, while younger children will love hearing them read. From ChristianFocus Publications.